The paper considers the problems of ontology-based collection of information from the Internet about scientific activity for the population of the Intelligent Scientific Internet Resource. An approach to automating this process is proposed, which combines metasearch and information extraction methods based on ontology, thesaurus and pattern technique. In accordance with the approach, specific methods of information extraction adjustable to the knowledge area and types of information resources are developed for every type of entities (ontology class). Each of these methods includes a set of query templates and a set of information extraction patterns. The query templates constructed on the basis of an ontology class description are used to generate queries to search engines in order to collect web documents containing information about the individuals of this class. 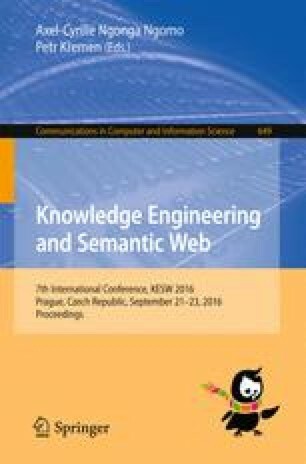 Web documents gathered using metasearch methods are analyzed by applying the information extraction patterns. For every kind of information to be extracted, these patterns give text markers defining their position in a web document. The patterns are generated on the basis of an ontology taking into consideration the structure of web documents. Several patterns can be combined together to extract information about related entities. To improve the recall of information extraction, the patterns use alternative terms in different languages from the thesaurus (synonyms and hyponyms) to describe the markers. Experiments showed that the proposed approach allows us to achieve an acceptable recall of the extraction from the Internet of information about scientific activity. The authors are grateful to the Russian Foundation for Basic Research (grant № 16-07-00569) for financial support of this work.